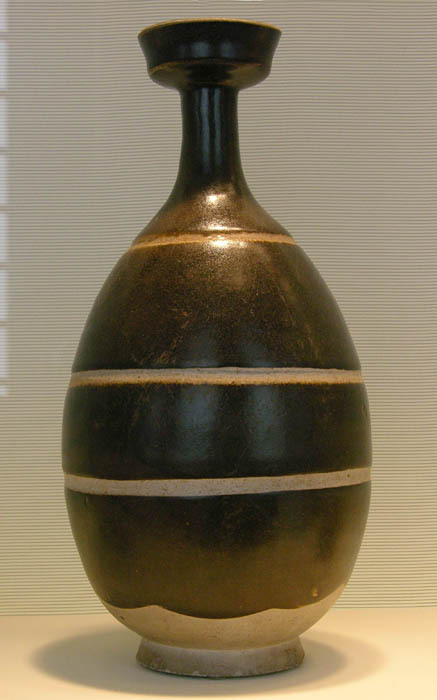 Bottle with Dish-shaped Mouth, Sui or early Tang dynasty: 7th century, stoneware. When I traveled to Boston last week to see the Melendez exhibit, which I wrote about here, I took along my camera; I've discovered that I deeply enjoy engaging with the things in a museum through my camera. As opposed to being a mechanical barrier, the camera encourages me to look more closely. I was thrilled to discover a wonderful collection of early Chinese pottery in a corridor at the museum. 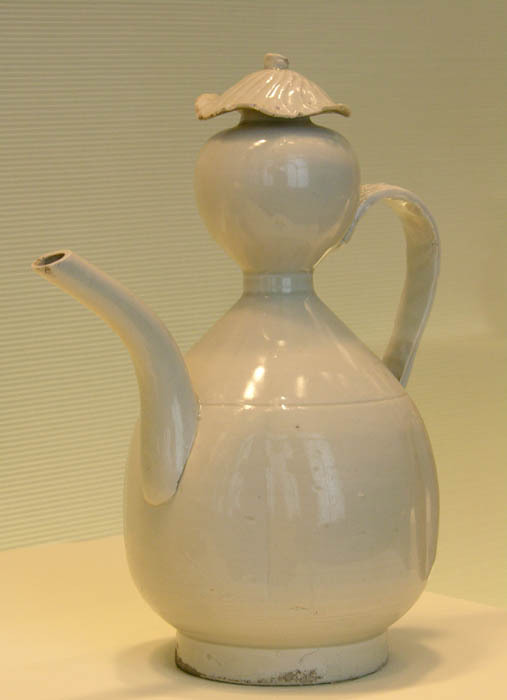 Pottery is an art form that provides rich aesthetic pleasure for me; I've written previously about Chinese Porcelain and American Art Pottery. Here are things, solid and present, made for use, however elevated, made with an eye toward beauty of form and color. 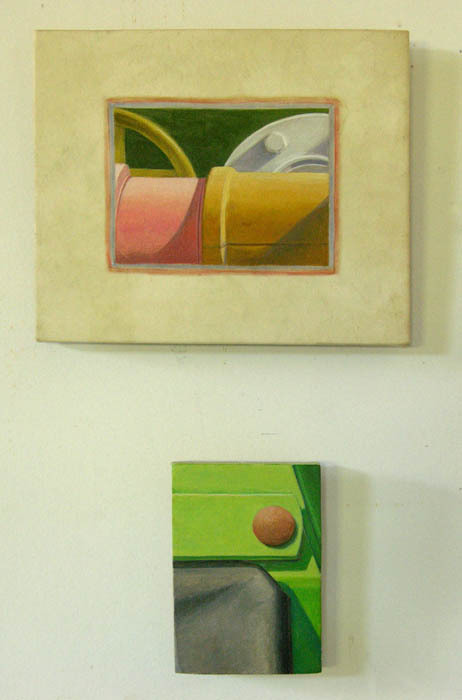 These very early works transcend time, and would be perfectly comfortable in a contemporary setting. Bottle with Abstract Design, Tang dynasty: 7th-8th century, "Sancai" polychrome ware, earthenware. Circular Box with Dotted Design, Tang dynasty: 700-750, "Sancai" polychrome ware, earthenware. 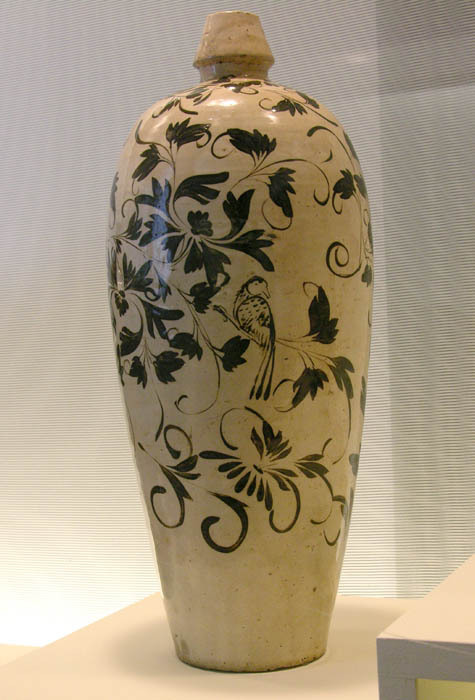 Jar with Striated Decoration, Tang dynasty: 700-750, earthenware. 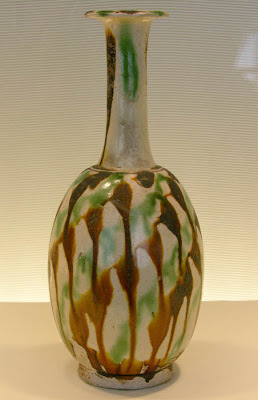 "Sancai" meant three colors, which we can see in the bottle above; the technique was also used for the ceramic Luohan I wrote about here. The perfect drips on the bottle, an artful combination of accident and control, emphasize its elegant shape. 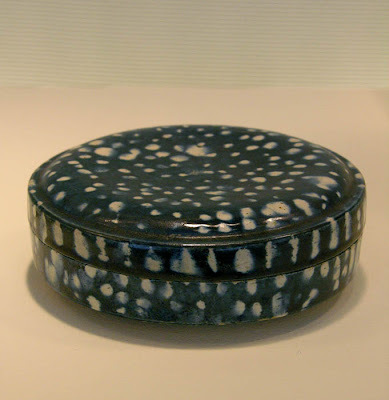 I love the glazed pattern on the small, around 4 inches, round box. 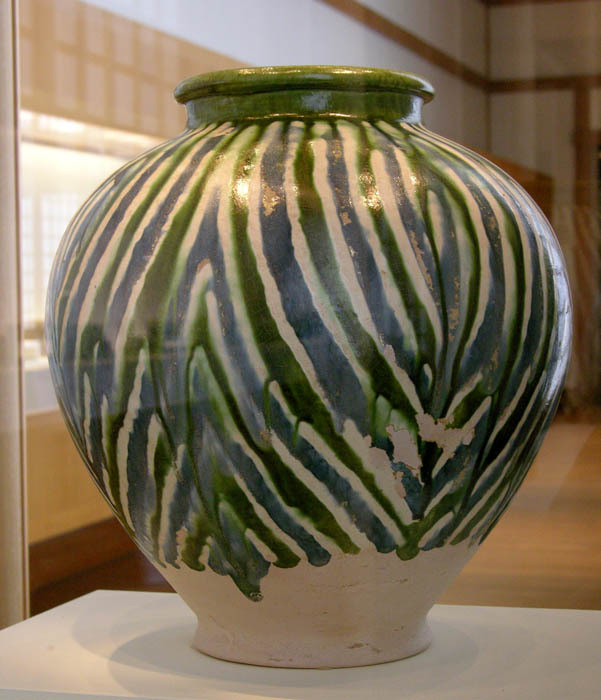 It is called Sancai although it is not three colors; the large jar, with its imposing form and blue and green glaze, did not have Sancai on its label, but it seems that it should. The last three pieces I'm showing were made later and have a more refined quality, which I don't at all mean to imply is "progress", just as I don't see early Italian Renaissance painting as lesser than the more "realistic" High Renaissance. They are simply different. I love the beauty of sinuous line in the decoration below, the elegance of shape, and the charm of the little 'hat' on the gourd-shaped ewer. Each one of these pieces of ancient Chinese pottery is something I would love to hold, to spend time with, while contemplating how a human-made object can enlarge our world. 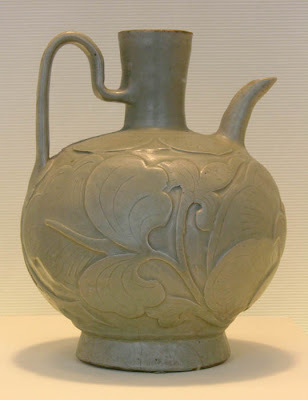 Ewer with Double Spout, early northern Sung dynasty, 10th century, stoneware with green glaze and carved floral design. Wine Bottle with Bird among Leaves, northern Sung-Jin dynasty, 12th century, stoneware. Ewer in the shape of a double gourd, northern Sung-Jin dynasty, 12th century, porcellaneous stoneware. This is not an image from my archives; it was shot this morning, April 28th, at 9:58 AM. 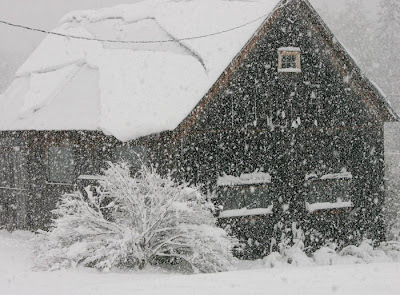 We have just had a record setting snow fall for this late in the season. I went out to measure the snow at around noon, after digging my high snow boots out of the closet where I thought they were safe till next winter; there was 11 inches!! and it kept snowing. and snowing. 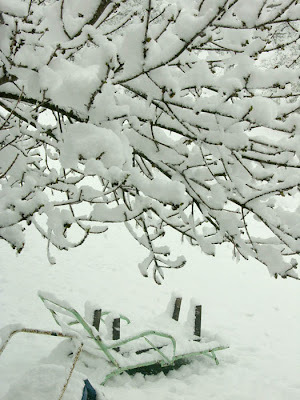 It snowed lightly until late afternoon. 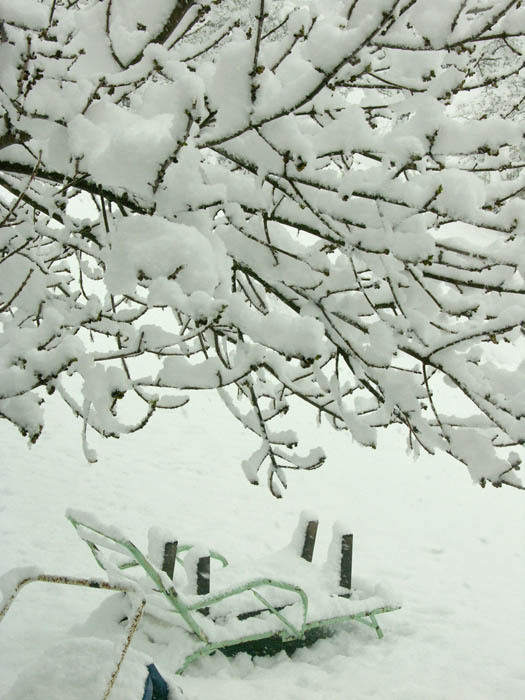 By mid afternoon, the warmer temperatures and high winds had removed the snow from tree branches, but earlier the snow coated branch and stem. 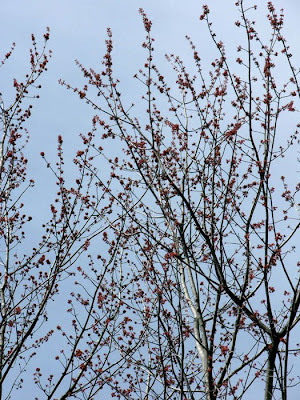 A pretty sight in January, but in spring, covering the opening buds and new leaves and all the flowers, it is not welcome. Thankfully, now, after 5 PM, the snow is already retreating and 70 degrees is forecast for the weekend. 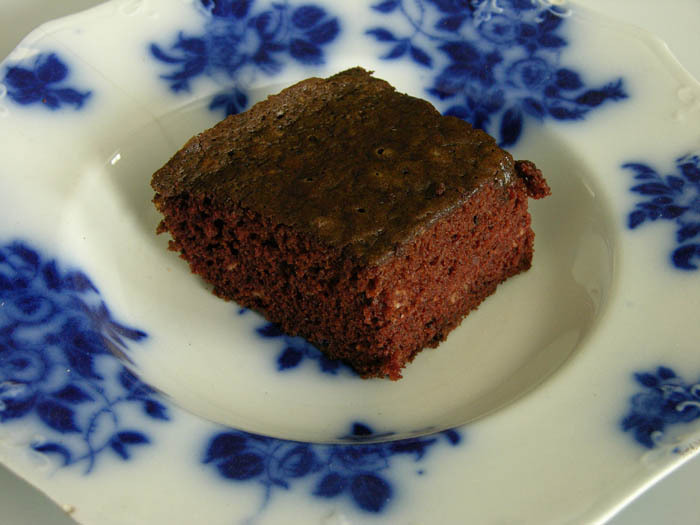 So, the only remedy for a day like this is chocolate cake. This cake is good: a simple, not too rich, but nicely moist, vinegar-chocolate recipe given to me by a friend years ago. It's perfect for a needed pick-me-up; what is it about chocolate that makes us feel better? Because my egg tempera book, The Luminous Brush, is now online, with its numerous step by step illustrations, I thought I'd show the process of making one of my small temperas on calfskin vellum. I am working on a panel that is 4 7/8 x 3 inches; I stretched the vellum over a piece of 1/2 inch birch plywood, using a method that I describe in this post. The first thing I do is trace the drawing onto the vellum, using a piece of newsprint paper covered with chalk to transfer it. 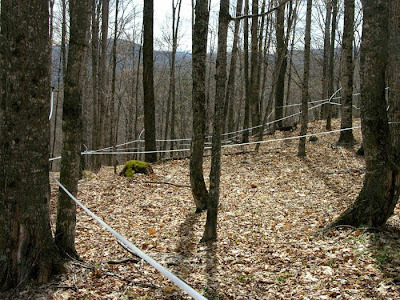 I then paint over the chalk lines with a light color, such as an ochre, and then wipe off excess chalk. 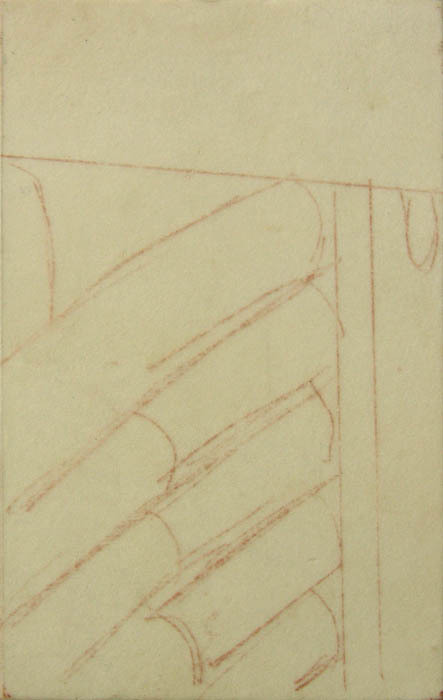 As you can see with the line drawing, and with this first blocking in of the color, I start off fairly loosely, not worrying about exact color or placement of form; I just want to get the surface covered so I can see the balance of elements, which here are a closely hemmed-in row of tubular forms. I should remind you that with my paintings on vellum I am using the white of the egg––glaire––as a medium, instead of the yolk which I use for painting on a gesso panel. 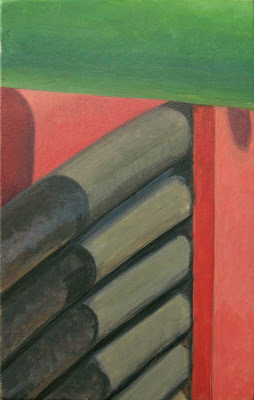 For paintbrushes, I use round brushes, #s 2, 4, 6, sometimes #8 for broadly brushing in the beginning of the painting. When I wrote my book, I was using Kolinsky sable brushes, but now find that high quality synthetics work very well for me. I recommend Stratford & York Rydal Gold 001 brushes; I order mine from The Studio Store in Johnson, VT. In this second image, I've added more color layers and begun to adjust the drawing. 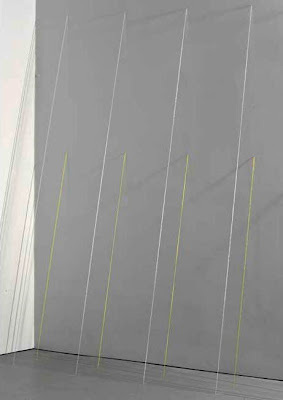 I like there to be many layers of paint because I feel that the final painting benefits from the richness of the layers one on the other; an illusion of density and volume is helped by this process. In the third step, I've put more color on the black forms so that they are becoming less transparent. On the small red triangle above the blacks I painted a light value of cadmium red medium (adding white to a color makes it more opaque) over a lighter red. I found that this wasn't bright enough so I scumbled (placing a lighter value over a darker one) a yellow-red over it. (Here I will say that to really see a step by step I'd have to shoot the painting every couple of minutes, because it changes that quickly, which is one of the great joys of tempera: its quick drying character enables fast changes.) To bring the color back up, I then glazed a thin coat of red over the lighter color. This was the end of my first session with the painting, which took about 2 hours. 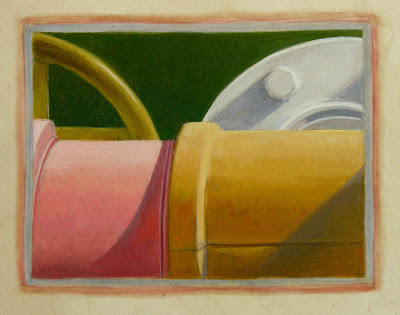 The next day I started by working more on the hoses; I like to work back to front because it is easier to overlap forms. I started building up more of the light values in the hoses, and made more drawing corrections. I use a ruler and a t-square with a hard pencil to draw straight lines. I completed the hoses, trying to make smooth transitions of value to give the illusion of roundness. In the shadows, I put some cool lights––you can see the bluish tones––and warm-colored reflected lights towards the bottom of each hose. I also worked on the vertical reds on the right, going back and forth between lighter and darker values (you can see some darker paint at the bottom right) in order to get a color that looks like red in sunlight and not like pink. 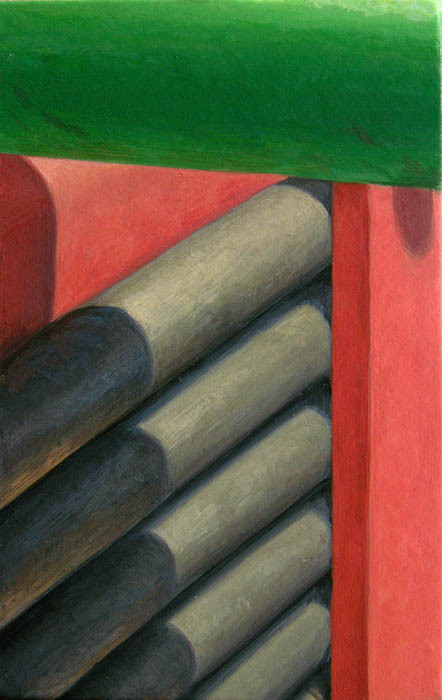 Some big developments in this final step of the painting: the green form at top is finished with a strong bright color; the reds are enriched; some stronger darks in the hoses make more dramatic volume. This second session of painting took a little over 3 hours, so altogether I spent a little over 5 hours completing the painting. That is quick, but the work is very small, and for me tempera is a very fast medium, allowing for rapid adjustments and layerings of paint. I can see myself doing many many paintings in a year––75? 100?––and then sorting through them to pick out the best. 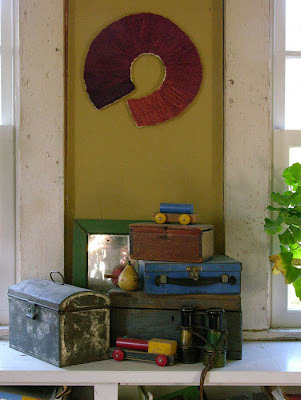 What fun to play with shape and color! 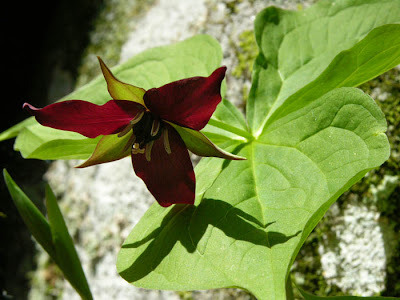 During my walk on Friday, I spotted several of these beautiful dark red flowers, rising above 3 broad leaves. 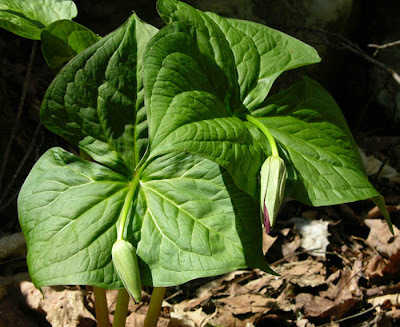 I was so excited; I'd never seen trillium before in my spring tramps through the woods. It may be that I generally took my alternate walk during this season and the growing conditions a mere quarter mile away weren't ideal for this flower. But here they were, many of them, nodding their gracious heads, growing on the eastern facing side of a stone wall, which runs along an ancient town road. 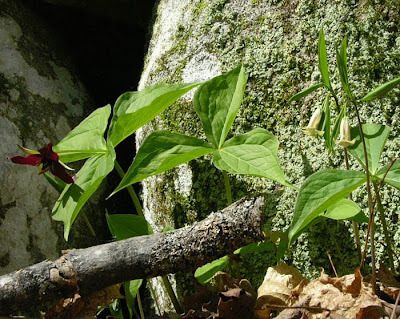 When I first saw this grouping of leaves, much larger than the others in the area, I thought it might be a larger white form, but now I see the flowers are opening to red. 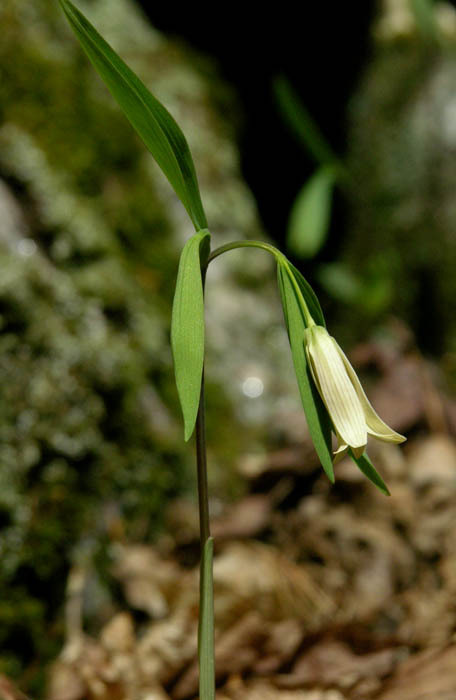 Along the same wall is this beautiful little plant, with a thin stalk ending in flowing slender leaves and an elegant tubular flower with outcurved petals. My nearest guess is that this is a bellwort, though my wildflower book says it's yellow; to me it looks cream, almost white. As you can see in the photo below, they are a happy companion to trillium, and their contrasting colors and shapes make a beautiful display. Yesterday my yearly order of 3 cords of split firewood was delivered; late April is generally a good time for this: the ground is dry enough so that the heavily laden truck won't sink too much into the lawn, and it'll have a good 6 months for drying. 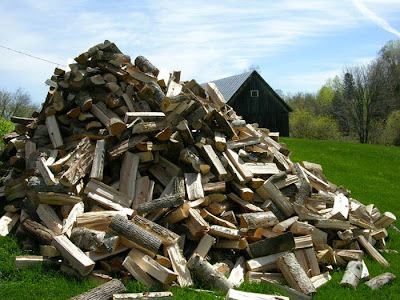 I love the spicy smell of freshly split hardwood, a unique scent that fills the air around the big pile, which is then transferred to the shed. 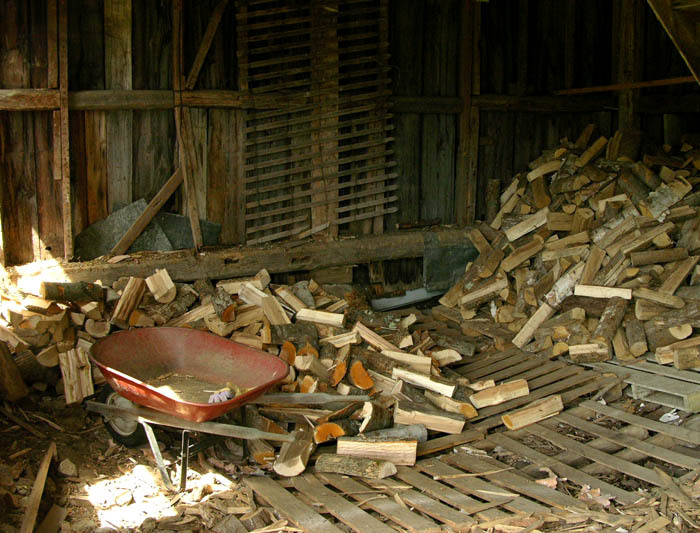 Attached to my house is an open shed where I store my firewood, along with my garden machinery and tools. 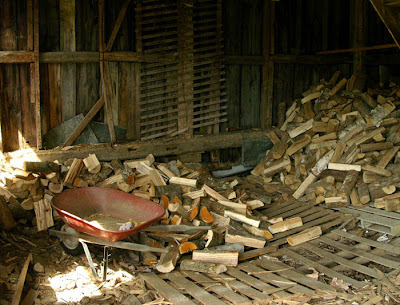 As you can imagine, it's quite a chore to transfer the wood from my lawn into the shed; I do a little bit each day, loading wood into the wheel barrow and then tossing it in a pile inside. 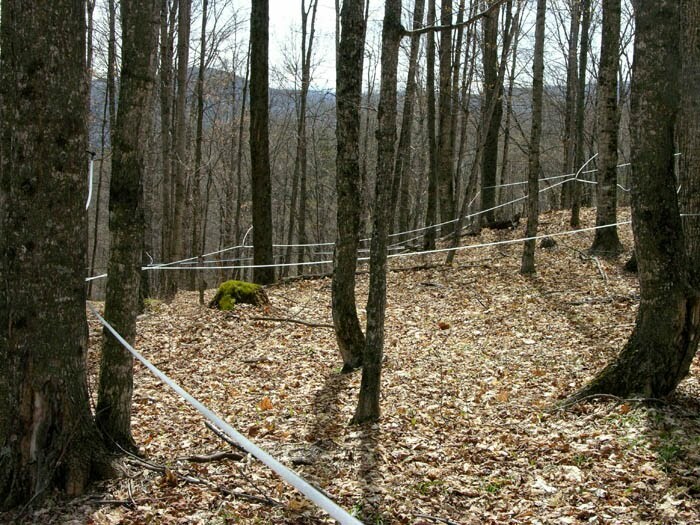 The mound of wood that you see on the far right is the remains of this past winter's wood, which I'll use for the remaining cold days of spring (snow predicted for tomorrow!) and the first months of fall. My small wood cookstove is my main source of heat, though I also have a back-up gas furnace. 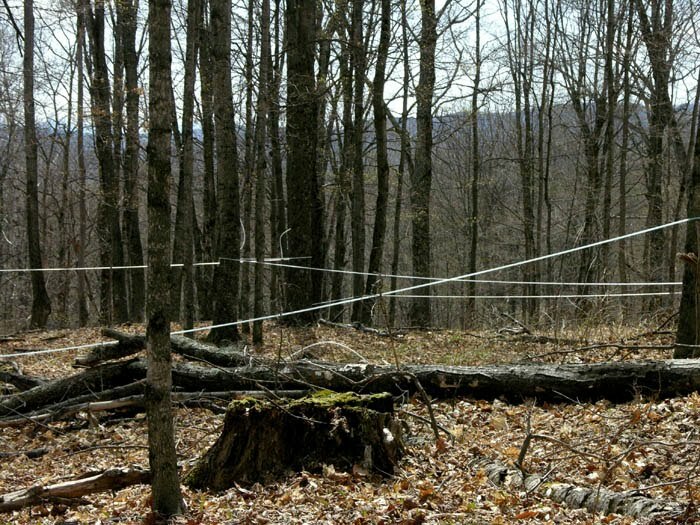 I enjoy this major chore each spring; I like handling the different kinds of wood, seeing their surfaces, their mosses and lichens; and I like the sheer physical effort, the repetitious movements, the accomplishment of moving a pile from here to there. 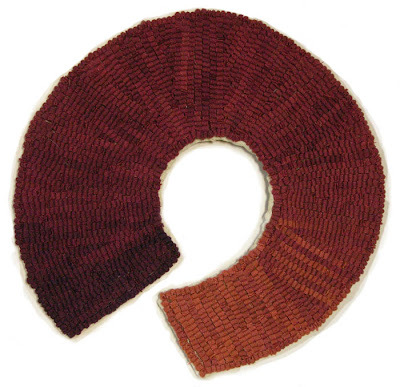 Red Curl is done, the curl tighter than I'd expected and the color transitions not quite as smooth, but I still like its odd shape, which makes me think of a snail. 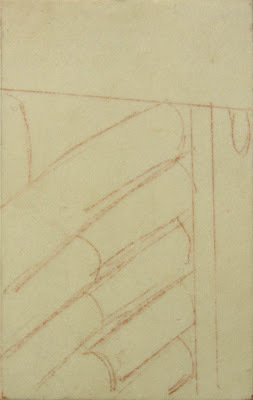 If you look at the study and the beginning of work on the piece in this post, you'll see that the two ends had more space between them than they do in the finished work. Something about the hooking must have caused the shape to tighten. The changes in color don't flow, but I prefer the liveliness that comes from bouncing from one tone to the next. If I'd wanted exact color transitions, I would have to do some "jar dyeing": dye placed in several jars in graduating amounts––1 teaspoon, 2 teaspoons, 4 teaspoons, etc––with small pieces of wool. 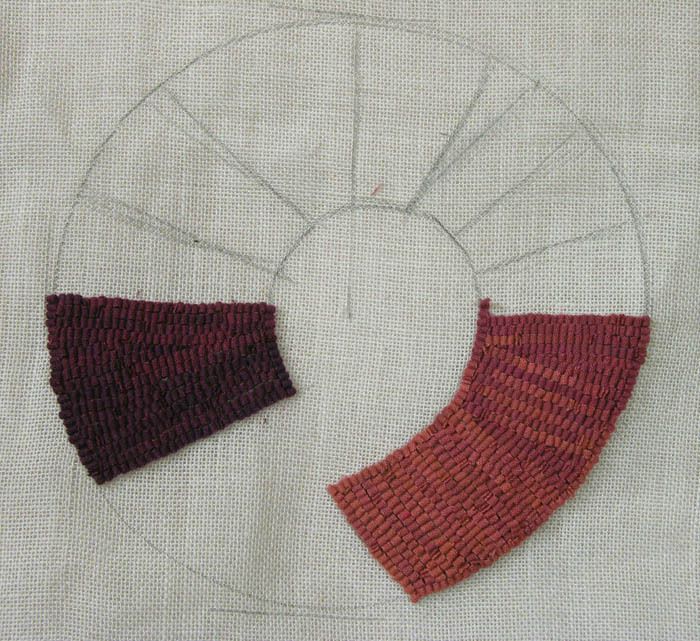 But since I'm not particularly interested in perfection, my less precise method of dipping the wool works for me. Below is Red Curl hung between the two south facing windows in my living room, above a group of objects gathered a few years ago for still life photography. My favorite bumblebees, their soft furry bodies striped with orange, have been visiting the newly opened grape hyacinths; there are one or two bees on the flowers throughout the day, so they must be very attractive to these small buzzing creatures. 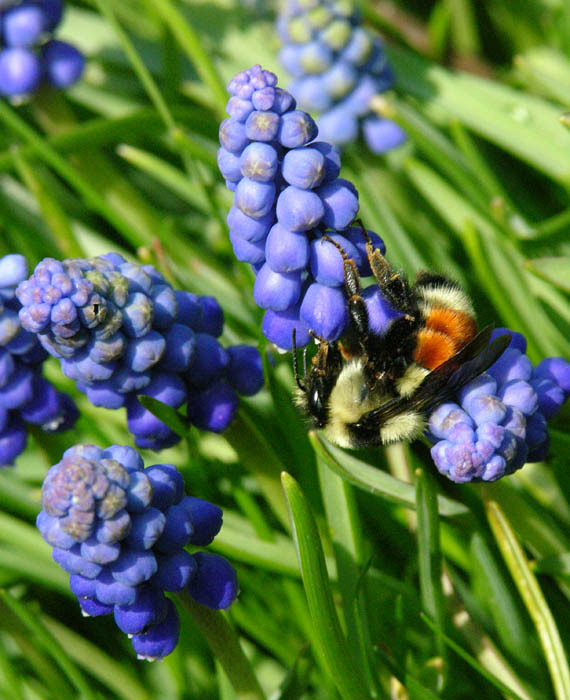 A couple of years ago, I was in Brooklyn in April when the grape hyacinths were blooming in front yards throughout the neighborhood; I fell in love with their clear pure blue color, gathered on a spike of small spheres, curving round the stalk according to the golden ratio. So I ordered bulbs and now have them blooming in my borders; I find them as lovely as the bees do, though my appreciation is purely aesthetic. Yesterday I went on an outing with a few friends: a day trip to the Boston Museum of Fine Arts to see the exhibition "Luis Melendez: Master of the Spanish Still Life". 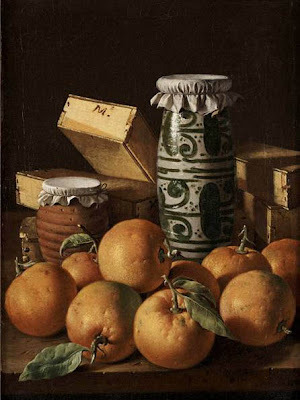 Since I visited the Prado Museum in Madrid over 20 years ago, Spanish still life painting of the 17th century, with its clear form, dramatic light, and rigorous composition, has been among my favorite art. Working a century later than the greats of the 'golden age' such as Sanchez Cotan and van der Hamen, Melendez pushed his objects out towards the viewer, and they seem to burst with a fullness of life; the illusion, the precision, and the carefully wrought compositions make the work seem very modern to me. I enjoyed seeing all the paintings, but I thought the most successful were the small vertical compositions in which the mundane things of the kitchen were essential actors in an intense drama, held by the edges of the canvas; objects are rendered with sensual attention, imperfections adding to character. Each thing proclaims itself, and becomes luscious, asking for a touch, as though it was a sexual being. 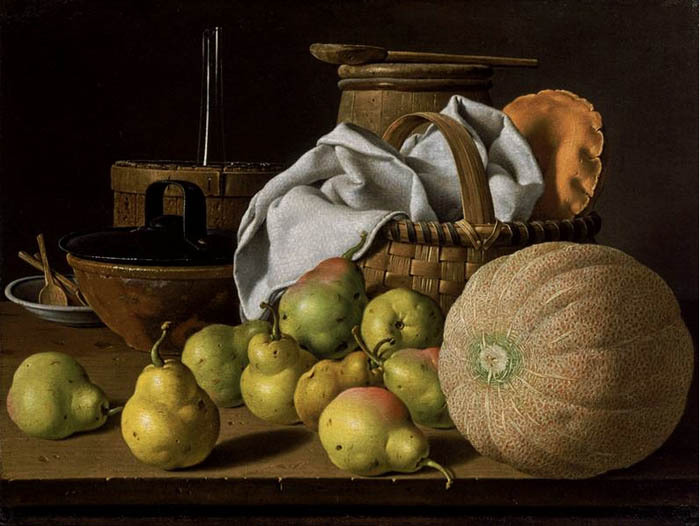 Even in this more complex composition, every object has a powerful presence; the artist has managed to paint each texture––the netting on a melon, a woven basket, an earthenware dish––without losing the sense of weight and volume; that melon is heavy. So, is this painting of oranges one of the sexiest you've ever seen? it is to me. In making this work, Melendez used one of Velasquez's tricks to make forms more lifelike: soften the edges so that they become a little indeterminate, replicating how our two eyes see around things. Some of the softness might have come from Melendez's moving the objects in the paintings to improve the compositions. 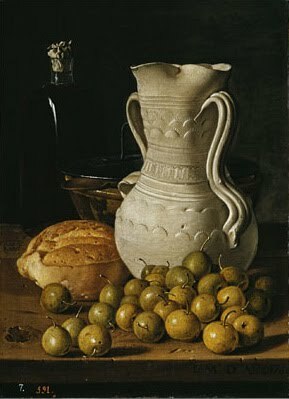 He had a strange way of working: not setting up an entire still life, but starting with one object in front, then adding one after another until his design was complete. X rays show many adjustments under the final painting. 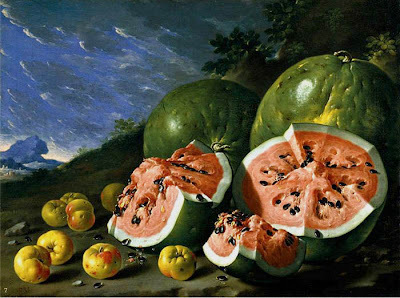 I love this painting, not for its ambition, but because of its juicy physicality. 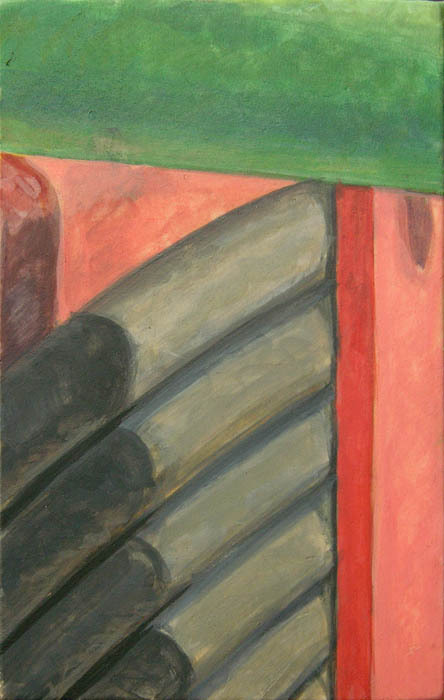 Looking at this work, it's hard not to have a memory of eating watermelon in summer, juice dripping down your chin. It calls up the texture of melon flesh and the smoothness of seeds, a visual delight telling of sensual pleasures. 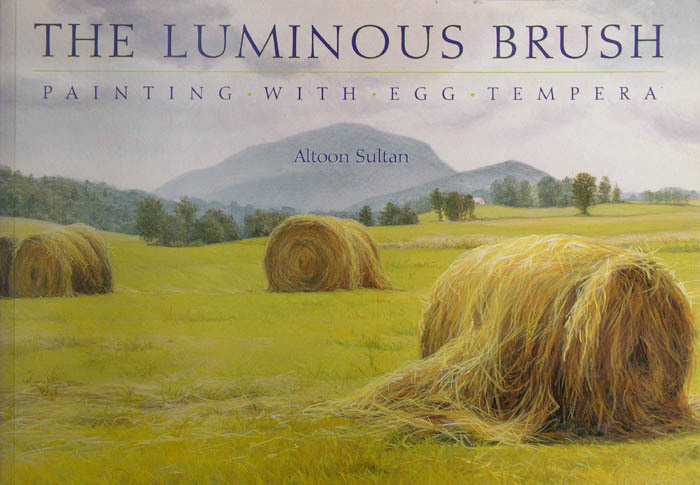 I'm very happy to announce that my instructional book, The Luminous Brush: Painting with Egg Tempera is now available for free online and as a PDF download. 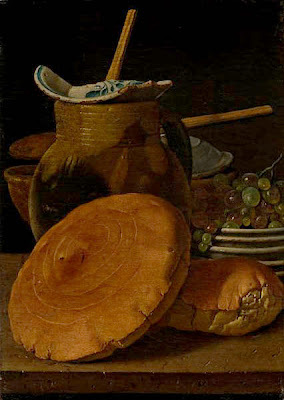 I first learned to use egg tempera when I moved to Vermont in 1994 after 3 years of teaching in California; I'd wanted to use the medium for a long time, inspired by Quattrocento Italian panel paintings––which I wrote about in this blog post––and finally had the time to devote to it. 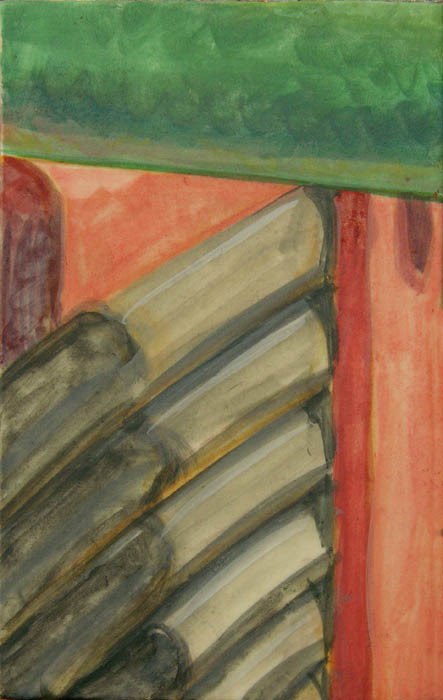 After working with tempera for five years, I put together a book proposal because there was no current book on egg tempera technique. 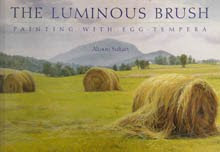 My technique––for instance see this post on brushstrokes––and my work has changed over the years, and I would write a different book now, but it is useful for a detailed look at the history and current practice of egg tempera, with lots of step by step illustrations. The Luminous Brush has been out of print for a couple of years and the rare used copies that show up online are terribly expensive, so I decided to send a copy of the book to Google Books for scanning. The online version of the book is rather washed out and fuzzy, but the PDF download (click on "PDF" on the upper right of the screen) is excellent. It is a large file, so will take a few minutes to download. I recommend viewing it on the latest version of the Adobe Reader, which you can download for free here. The link to The Luminous Brush online is above at "free online...." and here. *May 11 Update: The PDF version of the book hasn't been available for a while, but it is now online live! *March 10 Update: The Luminous Brush is now available as an ebook for $8. 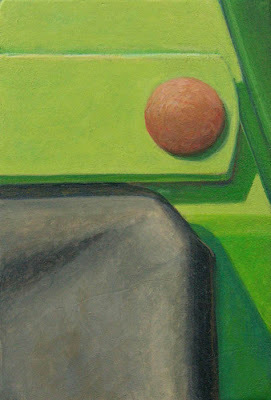 Rounds, egg tempera on calfskin vellum (parchment) stretched on panel, 3 x 4 inch image on a 6 x 7 inch panel. I am showing two recently completed works together because one of them, Rust Disk, is painted to the edge of its small panel, while Rounds is surrounded by unpainted parchment like my previous works. I actually finished Rust Disk a few weeks ago, before I worked on Five Circles, but waited to show it because I wanted to compare these two approaches, which you can see more clearly in the photograph below. 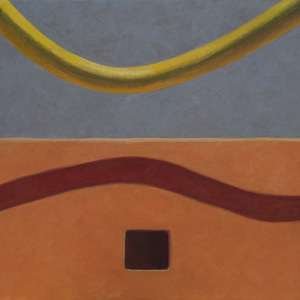 It's an almost unfair comparison because of the differing internal scale of the two paintings: Rust Disk has larger forms and is a more simple composition so inherently will have more drama. I've shown Rust Disk and Green Dots (framed like Rounds) to several people and we all seem to agree that painting to the edge gives a stronger, more modern look. I don't know if you, my readers, will concur with this opinion, but I think that's the direction I will take. 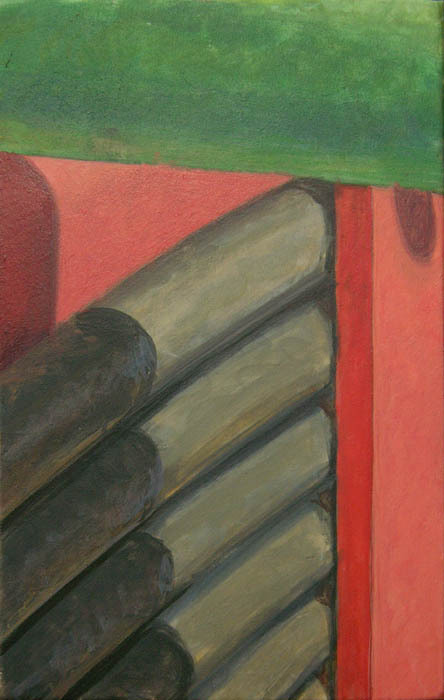 Another point: although the painting is very small, Rust Disk doesn't have the soul of a miniature painting; the form is simple and large in scale in relation to the size of the work; in this way it is closer to my larger panel paintings. So I think I will no longer call these works miniatures. Another thing I now realize is that I love love love working on vellum; it's a wonderfully sensuous surface and the color that I can achieve on it, using glaire (beaten egg white) as a medium is more saturated and intense than using egg yolk on gesso. I'm not sure if you can tell from the photograph above, but the works, stretched on 1/2 inch birch plywood, are standing out from the wall slightly. One thing I like about the gessoed panels is that they have a weighty presence, being over an inch thick. A problem to be solved with this new work is how to hang it so it doesn't look too slight. 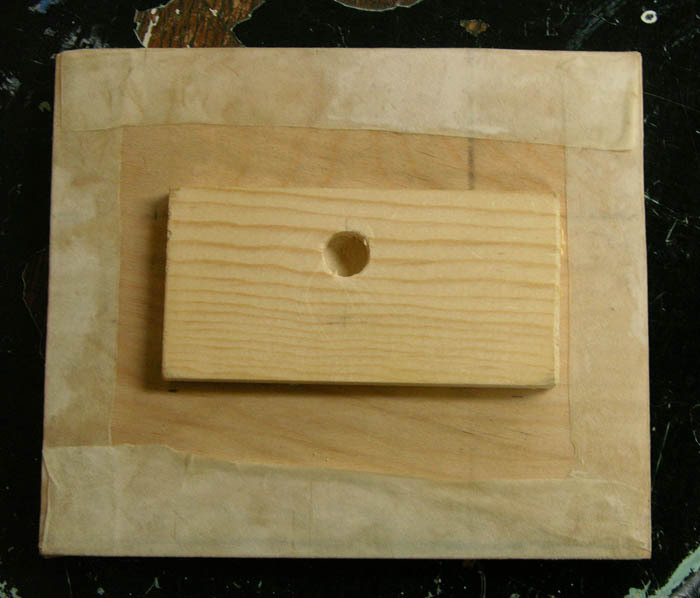 The solution is gluing a piece of 1/4 inch thick 2 1/4 inch wide, lattice to the back of the panel which makes it 'float'. I bought an electric drill and a 1/2 inch drill bit to make a hole for hanging from a small nail. So now my technical problems are solved; artistic challenges always remain. Sorrel is a perennial herb, harvested beginning in early spring, which should be in every garden so you can enjoy the lemony flavor of its leaves. 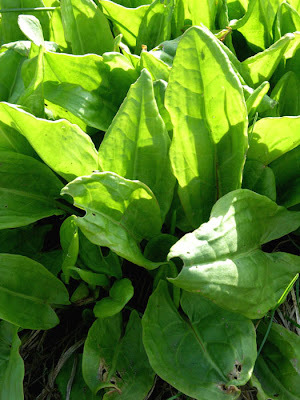 The young leaves are nice in salads; throughout the summer and fall I use sorrel for soup, hot and cold, for tarts (sorrel-onion tart, delicious) and for sauces. A nice soup for this time of year, being that I'm eating lots of potatoes––the root cellar potatoes are starting to sprout, so I want to use them before they spoil [I love potatoes! 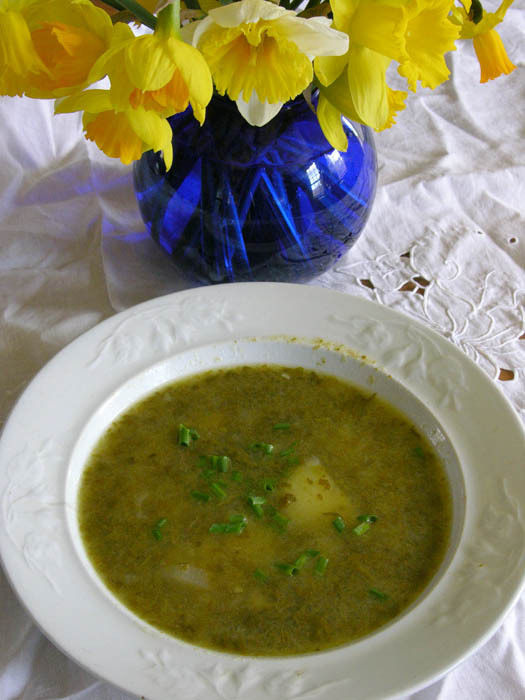 ]––is this sorrel and potato soup, another gem from Deborah Madison's The Greens Cookbook. Melt the butter in a soup pot with 1/2 cup water. Add leeks (or onions), sorrel and salt, and stew, covered , for 5 minutes over medium low heat. Add potatoes and cook another 10 minutes, stirring occasionally. Pour in the rest of the water, bring to a boil, then lower heat and simmer until potatoes are tender, about 1/2 hour. Taste soup, adding salt if necessary. Serve with grinding of pepper and garnishes. Today was an utterly dreary day: I woke up to a snowy landscape, 2 or 3 inches covering everything; pretty in December, not in mid-April. 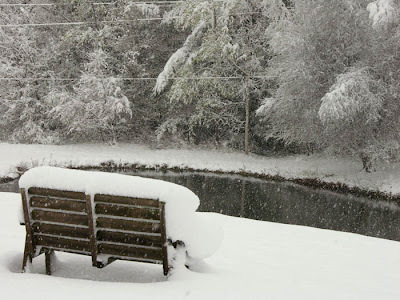 Not only that, it continued to snow lightly for a few hours and was so cold––the temperature stayed in the 30s––that the snow didn't retreat much during the day. I didn't have the heart to photograph the poor daffodils under snow, so instead here are images that I shot a couple of days ago. 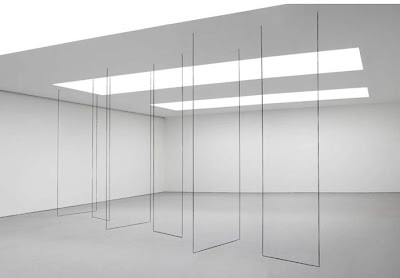 Sandback worked with the simplest of materials––acrylic yarn––to make us aware of volume, yet with no mass. Space is a poetic presence, an idea, quietly engaging our senses. After doing the ruglet Blue Sweep, I thought I'd like to do more shaped works, which engage space differently than an image on a rectangle. 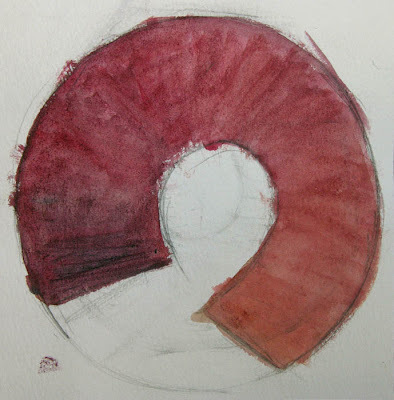 I did lots of thumbnail sketches with a circular theme and kept coming back to the idea of an incomplete circle, so I did a watercolor sketch using a gradual color and value shift from one end to the other. 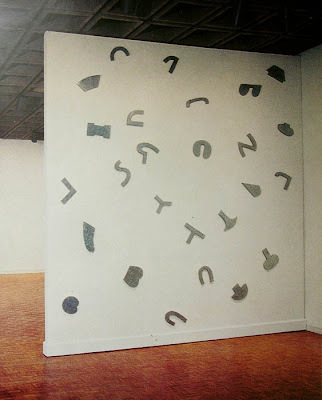 When discussing Blue Sweep in comments, I thought of Richard Tuttle's piece Letters, a wacky take on the alphabet. Though I didn't use his shapes for this work, he continues as an inspiration (as I wrote about here). An aside: I recently watched Herb and Dorothy, a documentary about an unusual art collector-couple which included an interview with Tuttle. At one point he said, speaking of Herb "something goes from the eye to the soul without going through the brain", which is a lovely thought; even though I mull everything over, I love the idea of a mystery at the heart of the art enterprise. 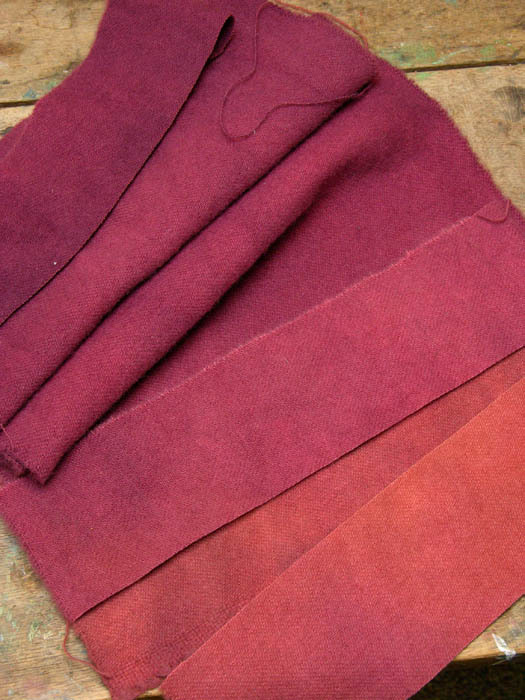 Here is the wool for the project, which I dyed by dipping a long piece of fabric in a pot so that one end got much darker than the other. I added some blue to the red at the darkest end and some yellow at the light end; this increases the color change so that it's not only dark to light but also cool to warm. I hope this creates an illusion that the right end of the curl is moving forward in space. Below is the start of the project; I have to pay quite a bit of attention to my colors as I hook, to try to get smooth transitions of color: no auto-pilot on this one. 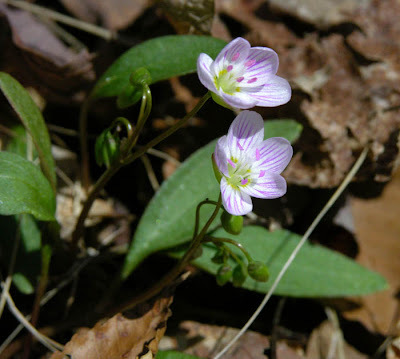 The first tiny wildflowers have begun to appear on the forest floor, brightening my walks with spots of jaunty color singing out from the background of dried leaves. I believe that the yellow flowers are a kind of violet, but I'm not sure. 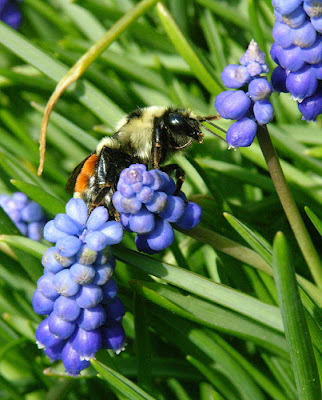 Perhaps our resident naturalist, Susan, will identify the flowers for us. Update: Susan has come through and identified the top flower as "Spring Beauty", Claytonia Caroliniana, and they're edible. 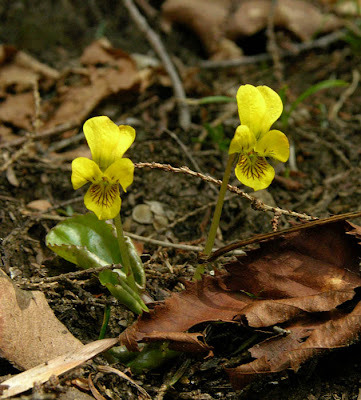 The flower below is a violet as I thought, possibly Viola rotundifolia. 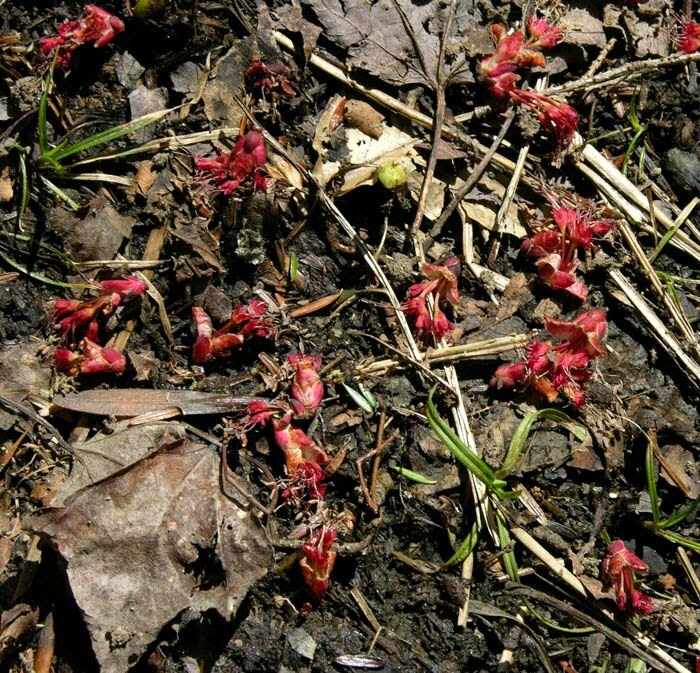 In comments about the ruglet Scarlet Vessel, Susan mentioned that the color of the ruglet was the same as red maple flowers, below. Ah-hah! those were the flowers that I saw strewn over the ground on my walks. It turns out that those are the spent male flowers, while the female flowers remain on the tree, a decorative frothy red, and develop into scarlet winged seeds.